does any one have part numbers for the high speed bearings that have the ceramic bearings. supposedly the high speed bearings that are not ceramic have a tolerance issue after getting hot and have problems past 50k rpms. Im looking at doing an after market impeller and an over drive pulley, so I would prefer the better bearings. If you have a hardware store that sells o-ring in length you can try to make your own. I did that for my volute oring. Just super glue the ends. Look at post 200 page 6 for the large seal. LOL! I have thought about it and also rebuilding for people as I have been a tech for over 10 yrs.. That may come but I would rather help out for now and also screw Vortech at the same time by showing people which bearings and where to get them. There ripoffs and would rather tell you your supercharger is junk and instead of fix it, make u buy a new one instead of fixing yours. So here is the pic of the boxes my bearings and seal came in that I put in my S-trim with part numbers. Under $90 total. When I look up the smaller high speed bearings they are classified as ABEC-1 bearings instead of ABEC-7. What exactly does that mean? Perhaps that's why they're 40 bucks each instead of close to 100 each! 1995 GT - H pipe and welded in Flowmasters. Stock otherwise. There are two problems with the system. 1st is there are more parasites than hosts.... second, the parasites are allowed to vote. "The ABEC scale is an industry accepted standard for the tolerances of a ball bearing. It was developed by the Annular Bearing Engineering Committee (ABEC) of the American Bearing Manufacturers Association (ABMA). There are five classes, going from widest tolerances to tightest: 1, 3, 5, 7, and 9. Higher ABEC classes provide better precision, efficiency, and greater speed capabilities, but do not necessarily mean that the bearing can spin faster. Additionally, the ABEC rating does not specify many other critical factors, such as smoothness of the rolling contact surfaces, ball precision, and material quality. If you really want to dig into the subject, there's a whitepaper HERE. Thank you Andy! Yeah I'm not comfortable putting a 20-40$ bearing in place of a 150-250$ bearing! soooo, after researching off and on I think ive found the part numbers for abec 7 bearings. if im right the larger bearings should be 205r and the smaller bearings should be 103kr. can anyone verify this? I think the ones in this kit are abec 9, can anyone verify this? 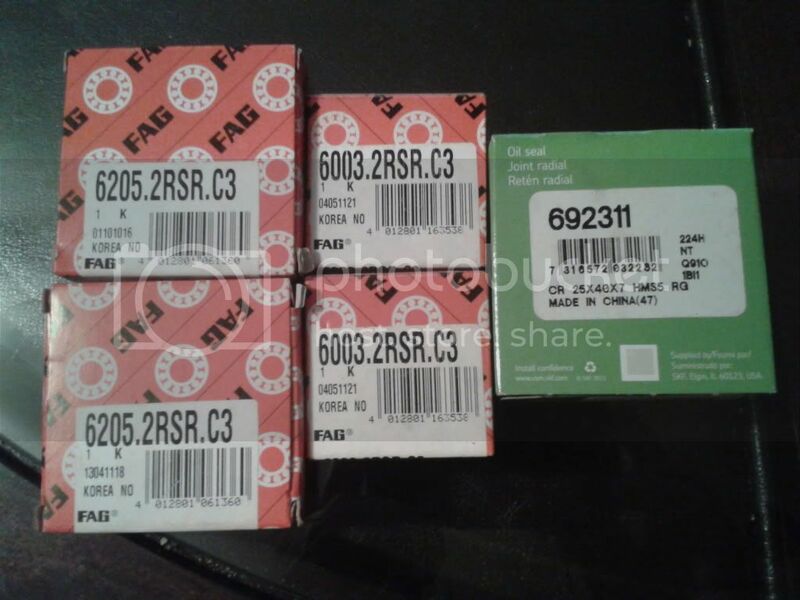 im also finding part numbers that are similar to the cheap bearings but instead of 6205 and 6003 they are 7205 and 7003 and are listed under abec 9 but there are several different suffixes and prefixes. When I googled the high speed bearing part number it said it was only a abec rating of one plus it was a double seal wouldn't that keep it from getting oil? Would you have the part number for the impeller side seal? When I contacted the bearing company they said that they really rated them by speed not abec rating? I know im bringing this back from the dead some awesome reading, I am looking to rebuild my ys does anyone know what part number bearings i need to get for this bigger blower? and where i should order them from? For those of you that need high speed bearings I found these. Barden - 103HDL. I had one of my high speed ones separate while I was taking the case apart to address another issue. I only needed one but I guess I'll have a spare since they are always sold in pairs.